Middlesbrough condemned 10-man Leeds to their 14th league defeat of the season. Boudewijn Zenden struck just after the interval, flashing a shot past Paul Robinson to finish off a flowing Middlesbrough move. After Gaizka Mendieta hit the post, Joseph-Desire Job extended Boro's lead with a smart left-foot finish. 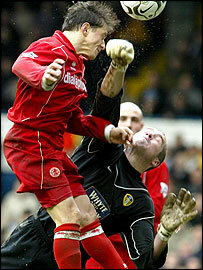 Leeds' miserable day was completed by Robinson's dismissal after the Leeds goalkeeper brought down Michael Ricketts, who converted the penalty. Middlesbrough arrived without Danny Mills - in the middle of a season-long loan spell from Leeds and contemplating a permanent move - after the defender decided it was best not to return to Elland Road. Youngster Andrew Davies came in for Mills in the Boro defence that was first tested on eight minutes with Mark Schwarzer saving a Gareth Southgate header from underneath his own crossbar after a Leeds corner. Gradually Middlesbrough began to emerge as an attacking force, with Mendieta prominent. After Juninho had been brought down a yard outside the penalty area by Matthew Kilgallon, Mendieta curled a right-foot shot narrowly over Robinson's crossbar. The Leeds goalkeeper then made a superb save low to his right from a Mendieta half-volley. Juninho was following up but Robinson managed to push the ball away for a corner. Juninho then ballooned a shot over the bar, though Zenden did better with an angled drive. Middlesbrough deservedly took the lead eight minutes after the restart. In an incisive move Massimo Maccarone's through ball found Zenden, who hit a first-time left-foot drive from 15 yards past Robinson. On the hour mark Alan Smith almost dragged Leeds back into the game. A shot on the turn from 15 yards took a slight deflection past Schwarzer's right-hand post, and from the inswinging corner Smith's glancing header went just over the bar. The impressive Mendieta should have killed Leeds off in the 64th minute but after exchanging a one-two with Zenden, the former Valencia midfielder hit the post. Job extended Boro's advantage with a cool finish after the Cameroonian was sent clear by Juninho's dummy. Another black day for Leeds ended with Robinson being dismissed for a professional foul after he brought down substitute Ricketts, who had come on for Juninho. The former Bolton striker then dusted himself down to slot home the penalty. Leeds: Robinson, Kelly, Duberry, Kilgallon, Harte, Pennant, Bakke (Morris 79), Matteo, Seth Johnson (Bridges 67), Smith, Milner (Carson 89). Subs Not Used: Barmby, Richardson. Middlesbrough: Schwarzer, Davies (Parnaby 53), Riggott, Southgate, Queudrue, Mendieta, Boateng, Doriva, Zenden, Juninho Paulista (Ricketts 85), Maccarone (Job 74). Subs Not Used: Jones, Downing.